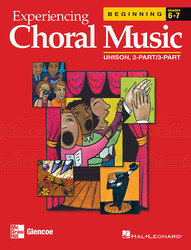 A comprehensive choral method developed by Hal Leonard Corporation for grades 6-12. This program contains new music, a new format, and new sight-singing materials. The National Standards are correlated to each lesson for quick-and-easy identification and reference. Skill Development exercises help students build vocals, theory, and artistic expression skills necessary to perform each piece. Rhythmic, melodic, and articulation skills are developed as needed for expressive interpretation. Creative Expression/Performance. Student performance provides opportunities for young musicians to demonstrate musical growth, to gain personal satisfaction from achievement, and to experience the joy of music making. Historical and Cultural Heritage. Experiencing Choral Music provides a vehicle to help your students gain knowledge and understanding of historical and cultural contexts across the curriculum. The Arts and Other Curriculum Areas. Choral Music provides a rich opportunity to connect the musical experience to other art disciplines, and to enhance the learning in other subject areas. Sight-Singing Textbooks that present a sequential approach to musical literacy and are directly correlated to the Mixed Voices, Treble Voices, and the Tenor Bass Voices textbooks.